Square Enix has developed quite a reputation for re-releasing games from the golden Squaresoft era. They get flak for it; a lot of people feel like they're not only capitalizing on gamers' nostalgia, much like Nintendo is wont to do, but also making a quick cash-grab, as many of the re-released games are quick and dirty mobile ports that sometimes feature glaring problems. Fortunately, Square Enix's latest announcement satisfies the nostalgia angle without any added despair. The company has recently revealed that they've been working on a full remake of Secret of Mana, better known to Japanese players as Seiken Densetsu 2, and the new version of the game will include full voice acting, new musical arrangements, 3D graphics, and various gameplay enhancements. Also, in an odd but fortunate twist for handheld fans, the game will be released for Sony's oft-neglected PlayStation Vita. This is great news for any players who missed the game the first time around; while 16-bit era titles have aged more gracefully than 32 or even 64-bit era games, they still sometimes feel dated or primitive by modern standards. Unfortunately, this means a lot of players have skipped over Secret of Mana, despite it being one of the most deloved RPGs of its time. With a modern remake, new-school players will get a fresh dose of old-school charm while everyone that remembers the original title fondly will get to relive the story in an all-new way. Of course, this isn't the first time that Secret of Mana has landed on handheld or mobile devices. Japanese players were given access to a mobile port of the game as far back as 2009, with an ehanced edition landing on iOS one year later and on Android devices three years after that. The title was also ported to Nintendo's Wii Virtual Console in 2008, and that version has became one of the most-appreciated ways to experience the Squaresoft classic since. Despite the added touchscreen-based controls and other smaller enhancements, however, all of those previous releases were simple ports of the original version of the game that launched on the Super Nintendo Entertainment System back in 1993. Square Enix's latest effort should prove to be dramatically different than the Secret of Mana re-releases that have came since the early 90s, and with that in mind, RPG fans and 16-bit era nostalgics have plenty of reason to get excited. 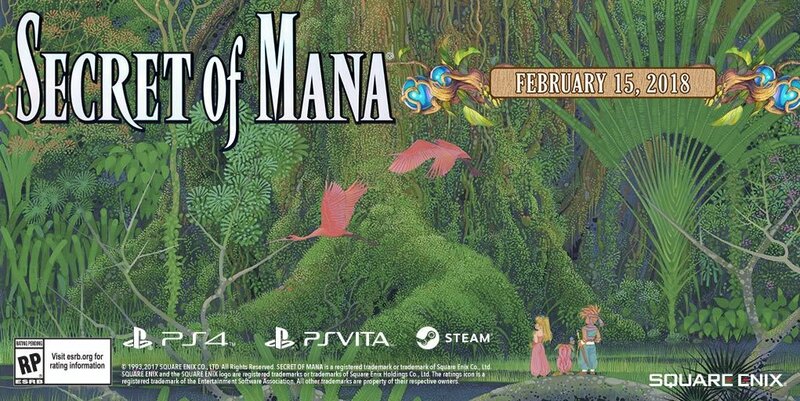 Square Enix's remake of Secret of Mana is slated to release digitally for Steam, PlayStation 4, and PlayStation Vita systems on February 15, 2018. Secret of Mana isn't the only great RPG to land on mobile and handheld devices. To discover more, check out our list of the Best Handheld RPGs.